에든버러, 스코틀랜드의 로얄 마일 백팩커스 | 호스텔월드에서 예약하세요. Smack, bang in the middle of town, you won't find a better location than the Royal Mile! 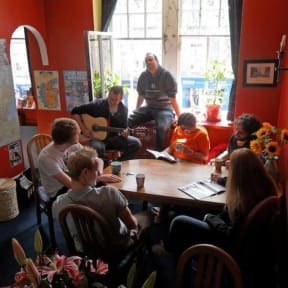 In our small and friendly hostel with an open plan kitchen and dining area, making new friends is easy. There is plenty of space to chill and chat with staff and guests in our cosy lounge area with an open fire. Our dorms are all light and bright and our bathrooms are clean and spacious. WE HAVE A MINIMUM AGE OF 18 YEARS. Sorry - no children! For guests under the age of 18 you must contact the hostel first for manager's approval. We have a maximum stay of 14 nights – sorry, no long-term accommodation. Any booking over Hogmanay (New Years Eve) includes the ticket for the street party. This property has a 2 day cancellation policy. Failure to cancel within this time will result in a cancellation charge equal up to the first two nights of your stay. Different conditions apply for August and over Hogmanay! - HOGMANAY (NEW YEAR'S EVE): For any bookings over Hogmanay (New Year's Eve) we will charge you the full amount on the 1st December. Should you book after the 1st December the whole amount will be charged within 24 hours after booking. Once this payment has been taken, no refunds will be issued. - AUGUST 2019: For any bookings for August 2019 we will charge you the full amount 14 days before arrival. Should you book less than 14 days before arrival the whole amount will be charged within 24 hours after booking. Once this payment has been taken, no refunds will be given. It was much better than I had hoped. Facilities and bathroom were clean and a bedroom was quiet. It had a right each share bed and shelves can lock by one's key. Wi-Fi was faster than other common hostels. Also, staff are kindness when checked in the room. Duvet and pillow cover were enough clean. Share bathroom is a little bit narrow and they don't have any towel. (but you can buy in hostel) The location is near the Edinburgh Waverly station you can't miss to find the hostel. 위치도 너무 좋고 리셉션 직원들이 다 착하고 친절해서 좋았어요. 여성 도미토리 10인실 썼는데 3~4명이 캐리어 펼칠 수 있을 정도로 넓고 좋았어요. 냄새도 안 났고요. 화장실 샤워실도 깔끔했고 샤워커튼도 매일 바꾸는 것 같았어요. 주방도 넓고 조리기구도 많아서 좋았고 체크아웃 전후로 짐도 무료로 맡아줘서 좋았어요. 워낙 번화가에 있는 호스텔이다 보니 밤에 조금 시끄러울 수는 있는데 여행하면서 피곤해서 그런지 그냥 잘 잤어요 ㅋㅋㅋ 여러모로 만족스러운 곳이었습니다! 기차역, 버스스테이션이랑 가깝고 에든버러 관광지가 다 걸어다닐 수 있는 거리라 위치도 좋았어요. 방이 넓어서 캐리어 펼칠 수도 있고 방안에 캐비넷도 있어요. 스텝분들도 모두 친절하셨음. Location was perfect-very close to a train stion and bus station, and most of tourist spots were in a walking distance. The room was big enough for reorganizing luggage or something. The staffs were very nice and helpful. 친절하고 좋음. 화장실이 매우 작고 불편. 방은 춥지만 1박 하기에 나쁘지 않음.